Bruce Mathiske enthrals his audiences with not just a phenomenal level of technical brilliance, but perhaps even more importantly, with an apparent instinctive ability to absorb and understand, then master and consummately deliver just about any style of music you could think of. He is the chameleon of guitar,a natural performer and this ability enables him the versatility to be booked in different configurations. Once described as uninhibited by direction, it is now clear that guitar genius Bruce Mathiske’s many eclectic & various music influences from his world travels have evolved into a style all his own. A new genre borne out of fiery fretwork unique to Mathiske has seen him touring the world with his Australian built guitar playing bass, rhythm and melody simultaneously to packed houses and standing ovations. His use of the guitar to become it’s own orchestra and encompass a huge range of genres have evolved into an exciting style all his own. You will be taken on a journey with infectious rhythms and fiery fretwork to delicate melodies. His International acclaim for his solo guitar career, include concerts in Denmark, Japan, Switzerland, England, Scotland, Ireland, USA, Canada and also performances at many festivals including the London Guitar Festival, France International Guitar Festival, Glasgow International Jazz Festival, the prestigious Edinburgh Festival plus many more. Guitar Master Bruce Mathiske, known for his amazing virtuosity and ability to make one guitar sound like an entire band, pays homage to an era that was vibrant and diverse. A time when music was a celebration and a lifestyle. This is the swing era. His love of the genre first came from his Uncle who played double bass and passed on his passion of the likes of Duke Ellington, Frank Sinatra, Django Reinhardt and the great big bands. Mathiske, an acclaimed composer himself says "It's these songs and melodies that allowed me to progress as both Guitarist and composer and it is important to honour these tunes with great respect". Expect a musical feast with Mathiske, a natural performer, playing the swing standards along with some essential Mathiske not to mention his easy going wit and charm. After many years of touring as a solo performer Bruce Mathiske turned his focus to composer, orchestrator and performer with orchestras of many types including chamber, wind and symphony orchestras. His recording of beautiful yet exciting orchestral music, we believe this music is very much for now, in that it combines, the world’s most popular instrument (the guitar) with the rich palate of an orchestra, in a distinct manner that retains classical sensibilities whilst adding Mathiske’s broader world sounds. The CD was recorded with The Metropolitan Orchestra at Trackdown Studios in Sydney. 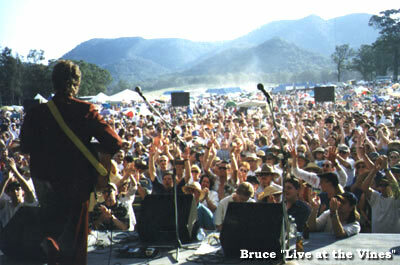 Book Bruce with Symphony, Chamber or woodwind orchestras.